Fitting distributions to data with paramnormal. In addition to explicitly creating distributions from known parameters, paramnormal. [dist].fit provides a similar, interface to scipy.stats maximum-likelihood estimatation methods. Again, we’ll demonstrate with a lognormal distribution and compare parameter estimatation with scipy. Let’s start by generating a reasonably-sized random dataset and plotting a histogram. The primary method of creating a distribution from named parameters is shown below. The call to paramnormal.lognornal translates the parameter to be compatible with scipy. We then chain a call to the rvs (random variates) method of the returned scipy distribution. Here’s a histogram to illustrate the distribution. Pretending for a moment that we didn’t generate this dataset with explicit distribution parameters, how would we go about estimating them? Unfortunately those parameters don’t really make any sense based on what we know about our articifical dataset. This matches well with our understanding of the distribution. The returned params variable is a namedtuple that we can easily use to create a distribution via the .from_params methods. 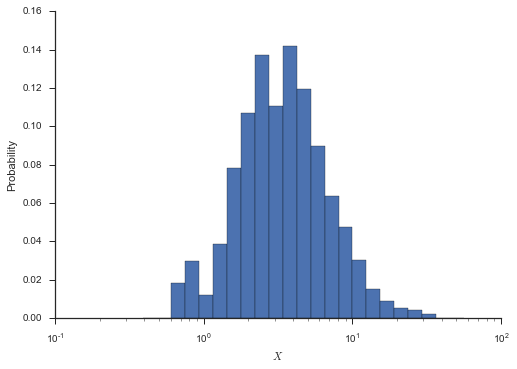 From there, we can create a nice plot of the probability distribution function with our histogram. © Copyright 2015 - 2016, Paul Hobson.